This one is my favorite “jadul” movie, it has a lot of new age in the film technique and one of the most “plot-est” movie i ever watched..
I’m trying to get a red line from the work of Akira Kurosawa (Rashomon) and Oscar Lewis (anthropologist and a film maker). Rashomon is a 1950 Japanese crime drama film directed by Akira Kurosawa, working in close collaboration with cinematographer Kazuo Miyagawa. It stars Toshiro Mifune, Masayuki Mori, Machiko Kyō and Takashi Shimura. The film is based on two stories by Ryūnosuke Akutagawa — (“Rashomon” provides the setting, while “In a Grove” provides the characters and plot). 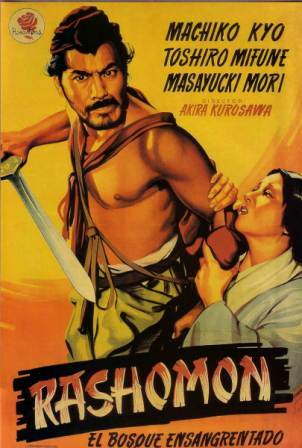 Rashomon introduced Kurosawa and the cinema of Japan to Western audiences, albeit to a small number of theatres, and is considered one of his masterpieces. The film won the Golden Lion at the Venice Film Festival and also received an Academy Honorary Award at the 24th Academy Awards. Oscar Lewis, born Lefkowitz, (December 25, 1914, New York City – December 16, 1970) was an American anthropologist. He is best known for his vivid depictions of the lives of slum dwellers and his argument a cross-generational culture of poverty among poor people transcends national boundaries. Lewis contended that the cultural similarities occurred because they were “common adaptations to common problems” and that “the culture of poverty is both an adaptation and a reaction of the poor to their marginal position in a class-stratified, highly individualistic, capitalistic society.” He won the 1967 U.S. National Book Award in Science, Philosophy and Religion for La Vida; A Puerto Rican Family in the Culture of Poverty. In this Rashomon movie we play an important role, we are positioned as a judge in which we hear all the testimony with their own version (Multiple Realities). And the works of Oscar lewis, the autobiography of mexican family (The chidren of Sanchez,1961) are using a ‘Rashomon-like’ techniques too, that is multiple versions of a single event by different informants. To increase the credibility and validity of the real event, the readers and the audiences can triangulate of each version to know what is going on/real event. By combining multiple realities, the readers or the audiences can hope to overcome the weakness of intrinsic biases and the problems that come from single version. In this movie we play an important role, we are positioned as a judge in which we hear all the testimony with their own version (Multiple Realities)and determine which one is correct. We made to see the woodcutter’s point of view and justify the story. As a judge/researcher, we are forbidden to subjectively on a single proof. In the presence of multiple Realities we should be able to know the truth, because humans have a self interest (shame, honor, masculine bravado, feminine virtue) that could change the real truth and a different conclusion. Ethnography are made, not found. Biella, Peter, “The idea of a field school in applied visual anthropology”, presented at the meetings of the American Anthropological Association, Philadelphia, PA. Dec. 3. Oscar Lewis, The Children of Sánchez(New York: Vintage Books, 1961), p. xxiii.